For those special moments when they just melt your heart, reward them with a CESAR® SOFTIES™ treat. With an irresistibly soft texture and mouth-watering. 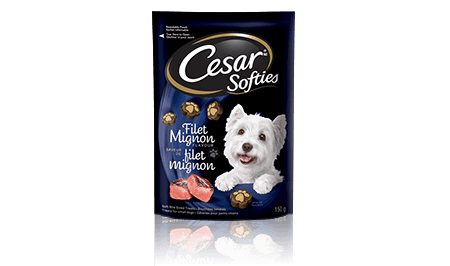 CESAR® SOFTIES™ FILET MIGNON FLAVOUR 150g is rated 4.0 out of 5 by 1. Rated 4 out of 5 by sophie12emma11 from Best By Date Bought a bag today and noticed the Best By date shows: 01 13 20 18 My first reaction was - 2018 - that is old! Then I figured it must be Jan 13 2020 and did not understand the addition of 18. Please change it to a clear date, e.g 2020-01-13 or 2020-JAN-13 so there is no confusion and possible wastage. RICE FLOUR, WHEAT FLOUR, SUGAR, GLYCERIN, PROPYLENE GLYCOL, ANIMAL FAT (PRESERVED WITH BHA), CARAMEL COLOUR, NATURAL POULTRY FLAVOUR, POTASSIUM CHLORIDE, SALT, NATURAL FILET MIGNON FLAVOUR, CALCIUM PROPIONATE, POTASSIUM SORBATE, HICKORY FLAVOUR, WATER, SODIUM TRIPOLYPHOSPHATE, TITANIUM DIOXIDE, COLOUR.